The presence of a handful of big companies make the global breast surgery retractors market increasingly consolidated, finds Transparency Market Research (TMR). The competitive landscape is intensely competitive and top players are focusing on innovative product launches at competitive pricing to stay ahead of others. Several of the leading players are consolidating their geographic reach and making and acquisitions, with an aim to retain their stronghold in the global market, notes TMR. They are increasingly leveraging the synergistic potential of mergers to strengthen their positions further. Top players operating in the global breast surgery retractors market are B. Braun Melsungen AG, Integra LifeSciences, Invuity Inc., and Accurate Surgical & Scientific Instruments. Some of the other prominent players in the market are Hayden Medical Inc., Novo Surgical Inc., Black & Black Surgical, Mediflex Surgical Products, CooperSurgical Inc., Medtronic plc, Thompson Surgical, and OBP Medical Corporation. The global breast surgery retractors market is projected to rise at a CAGR of 3.20% during 2017–2025 and is estimated to generate an overall revenue of US$328.68 Mn by the end of this period. The various breast surgical procedures where retractors are used are plastic surgery, breast reconstruction, mastectomy, and lumpectomy. Of these, plastic breast surgery was the leading segment in 2016 and is anticipated to retain its sway in the coming years as well. The lucrativeness of the segment is largely fueled by the extensive number of breast implants world over. 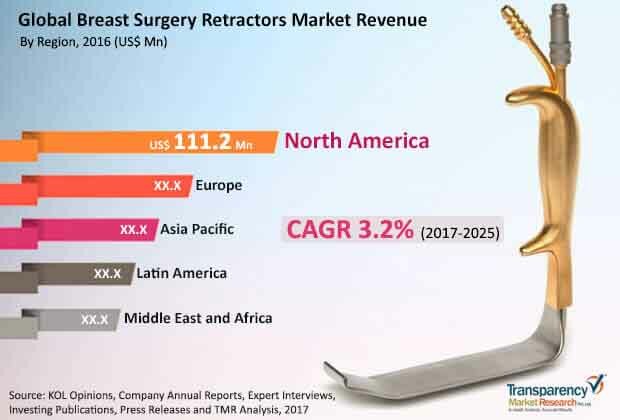 Of the various regions, North America leads the pack and is expected to reap vast lucrative gains from the prospectively burgeoning demand for breast surgery retractors over the forecast period. The rising worldwide incidence of breast cancer, especially in developed nations, and its substantial mortality, particularly in developing worlds, is a crucial factor propelling the demand for breast surgeries. This, in turn, is driving the demand for better surgical instruments such as breast surgery retractors. The rising demand for minimally-invasive procedures in breast cosmetic surgeries is fueling the demand for breast surgery retractors. The rising awareness of the risks of breast cancer in women has also led to a substantial rise in procedures such as mastectomy and lumpectomy, which is boosting the market. The rising number of breast augmentation procedures and implant-based breast reconstruction surgeries among women world over is a notable factor accentuating the demand for breast surgery retractors. This is in large part motivated by the rising awareness about breast aesthetics among women in various parts of the world. A growing number of medical device makers are focusing on research and product activities to launch novel products that are more precise and can improve surgical outcomes. This is opening promising avenues for market players. The growing demand for retractors that enable surgeons to get maximal exposure of the point of surgical dissection is a case in point. Moreover, the advent of advanced devices for improving the outcomes of breast augmentation and their rising application in minimally-invasive aesthetic surgeries are catalyzing the market growth. Furthermore, industry efforts to incorporate better device materials, such as polymer-based retractors replacing stainless steel types, is a notable factor paving way for potentially lucrative prospects in the market. The study presented here is based on a report by Transparency Market Research (TMR) titled “Breast Surgery Retractors Market (Product Type - Single-arm Retractors and Double-arm Retractors; Usage Type - Disposable Retractors (Lighted Retractors and Non-lighted Retractors) and Re-usable Retractors (Lighted Retractors and Non-lighted Retractors); Breast Surgery Procedure - Mastectomy, Lumpectomy, Breast Reconstruction, and Plastic Surgery; End User - Hospitals, Ambulatory Surgical Centers, and Gynecology Clinics) - Global Industry Analysis, Size, Share, Volume, Growth, Trends, and Forecast 2017–2025”.